Your Zodiac sign, or star sign, can tell you a lot about yourself. It can help identify character traits, personal strengths, and help you navigate situations that arise in your life. The darker side of Zodiac, known as Black Zodiac (no, not like “13 Ghosts”) often goes unexplored because of its taboo and inherently dark connotations. 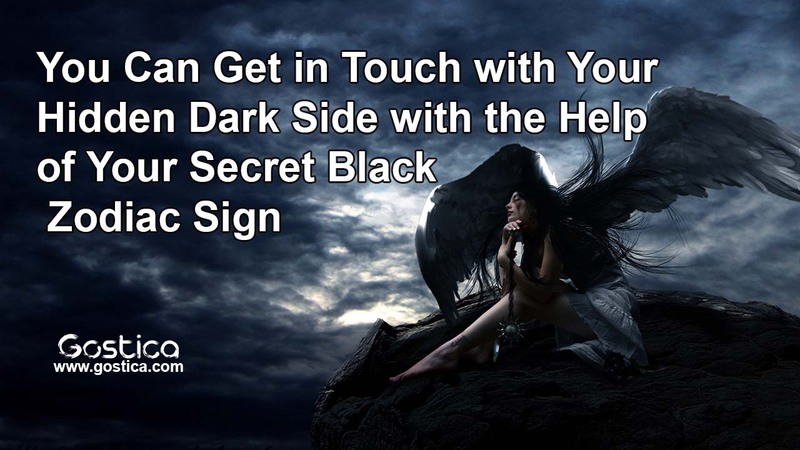 Here we are going to take a quick look at these shadowy star signs and see what kind of insights they might reveal to you about your darker nature. You can be greedy, at times. You want to have your cake, and eat it, too. Is that so much to ask? While unyielding desire might be a great motivator, it can also cause you to be blinded by your ambitions. Be careful not to let your desire for something or someone hurt those around you. Your path has been one of trial and error. Your past glitters with your many successes, but you also see a good number of failures in your rear-view mirror. It can be easy for you to see yourself as broken or flawed. Instead, you should value you your unshakable resilience and determination. Concentrate on learning from those failures, then moving on. Intimidation is well within your wheelhouse of expertise. Whether it is through physical presence or sharpness of mind, there are plenty who fear you. And with good reason. It is strongly advised that people do their best to stay on your good side. Just make sure when you unleash your dark side, it’s on someone who truly deserves it. Your cleverness and elegance make you a master manipulator. Your charm and intelligence make people both attracted to you and wary of you, all at the same time. You win favor and trust with absolute ease and have a habit of being quite persuasive. It is extremely important that you make sure you deserve the trust people give you, as it will no doubt be effortless for you to get. The ability to see things for what they are is both a blessing and a curse. You are able to see the beauty where others cannot, but you are also forced to see the harsh realities that others ignore. You are protective and exceedingly calculated. Being loved by you can be a blessing or a curse. While your devotion may be steadfast, this devout loyalty to those close to you can cause you to be jealous and possessive. You have to know when you are being unreasonable. Internal struggles are your battlefields. Your inner demons often try to surface in destructive ways, but they also help reach new personal and creative heights. You find the idea of “normal” repulsive and long for the days when you can be your whole self. Embrace the uniqueness of your personality while recognizing when your internal struggle has turned into something unhealthy. You have the impressive ability to see a situation and know the perfect time to strike. Simple strength does not intimidate or impress you, because you recognize the importance of control and timing. Your brutal analyses of situations can lead you to be cynical, so be sure not to analyze everything. The carefree nature of your personality makes you crave experience and adventure, sometimes no matter what the cost. Your wanderlust and entitlement to freedom can be soul-affirming, but it can be harmful if you constantly give into it. Blow with the wind, just maybe not all the time. Like a monster lurking in a dark abyss, your mystique can often cause people to fear you. You have tremendous strength and ability that you let very few people see, as your mystery is often a benefit to you. Just be sure you let those who are closest to you see those parts of you. Pain is familiar to you, and you absorb it from those around you. Your habit of battling on other’s behalves mixed with your need to internalize your own pain can make you a ticking time bomb. You are a sharp symbol of both victory and defeat. You battle tirelessly and will cut down those who mean to stand in your way. Your perseverance in times of trial is unmatched in those around you, and you know you have the ability to win. Be certain that your sacrifices are worth the spoils of war. Knowing about your darker side doesn’t have to be a bad thing. In fact, knowing about and becoming familiar with your Black Zodiac can help make your life better. It can help you recognize vulnerabilities and weaknesses in yourself that you might otherwise choose to ignore. It all depends on the person with the power, and that person is YOU. Empower your friends and loved ones by enlightening them to the dangers and benefits of their Black Zodiac!